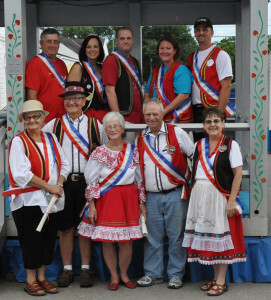 These community awards are given to individuals who have given of themselves to aid the Nebraska Czechs of Wilber in the promotion of the Czech heritage, culture and the Wilber Czech Festival. Beneath Mount Blanik, at the place where the natural spring waters bubble up from the earth, there is an opening in the rock face which looks just like a Gothic portal. This is the entrance to a massive underground cavern, consisting of a large chamber – also Gothic in style, like the great hall of a castle with heavy, arched ceilings and thick pillars. The columns are hung about with all manner of medieval weaponry, and hundreds of horses stand along one wall of the hall. Eerily, not one horsey tail in the bunch switches to discourage the absent flies, nary a whinny is heard from any of the many pairs of horsey lips, and no hooves stomp the stony ground, impatient to be off on a run. All of the horses stand stock-still in enchanted sleep. The main part of the chamber is filled with stone tables, around which stone chairs are arranged. In these stone chairs around these stone tables slumber the owners of the horses, the Knights of Blanik, slowly nod away the centuries, waiting for the day they will be summoned into action. This is the sleeping army of St Wenceslaus, and their day will come when things in the Czech lands are at their very worst – when the nation is beset by enemies too numerous to count. To recognize men who by their volunteer service, in the tradition of the legendary knights, have come to the aid of the Nebraska Czechs of Wilber, this award is presented. Princess Libuse was said to be the wisest woman in Czech history and the legendary founder of Prague. She ruled Bohemia in the eighth century. Daughter of the mythical ruler Krok, youngest of three sisters, she was chosen by her father as his successor. There were no regular courts, but people came to Libuse to settle their arguments. And although she proved herself a wise chieftain, the men were unhappy that their ruler was a woman. She said, You are right! I am a woman and I rule like a woman, not with a rod of iron, but with compassion which you take for weakness. You want a stricter ruler and your demand shall be fulfilled. You did not appreciate the freedom I gave you, you want a man who will take your children away to serve him, who will take the best of your cattle and horses for taxes according to his whims.She went into a prophetic trance and told them to go to the village of Stadice to find a plowman named Premysl, and bring him back to become ruler and her husband. This was the beginning of the Premyslid dynasty, the princes and kings who ruled in Czech lands until the murder of Wenceslaus III in 1306. To women whose volunteer work for the Nebraska Czechs of Wilber reflects their vision, like Libuse’s, for future achievements, this recognition is presented.